Below, excerpts from two descriptions. One is taken from a Xinhua story describing the “detailed standards” required of the 40 Shanghainese college students who will be selected to serve as “Olympic hostesses” in Beijing. The other is excerpted from the American Kennel Club’s detailed standards for the hairless Chinese Crested dog variety. Can you match the description to the photo? The correct answer – and commentary – follows the jump. Description A quotes some of the detailed Olympic hostess standards that Xinhua printed as further proof of the “meticulous planning for the Summer Games.” Now, just to be clear about this: I’m not comparing Chinese women to dogs (the Chinese women with whom I’m close wouldn’t stand that, not for a second). No, my question is a little more pointed, and it is this: why do Olympic organizers find it socially acceptable to grade women like dogs? And why doesn’t anybody – in particular, Chinese women – seem to take offense? If these standards ran in the US or the EU, there’d be blood to pay – and lawsuits. None of this should surprise anybody who’s spent any time reading Chinese in-flight magazines and their detailed descriptions of the careful, careful tests to which Chinese airlines subject potential flight attendants. 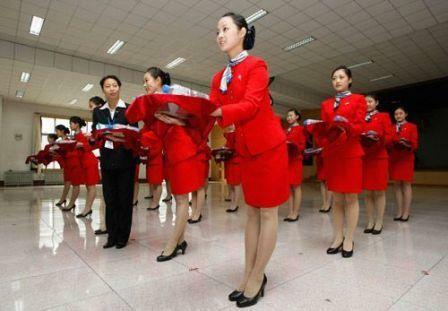 I have a quite detailed memory of a recent photo (I believe it was in the China Southern magazine) of a selection committee earnestly measuring the calf muscles of prospective flight attendants. Alas, I don’t have a copy of that issue, but for those who don’t believe me, I respectfully refer you to Ching-Ching Ni’s recent LA Times dispatch on the beauty pageant that China Southern holds (and televises) for the purpose of choosing new flight attendants (don’t bother applying if you’re over 24). I know, I know: China isn’t the only society that judges people on looks, and it certainly isn’t the only country that holds beauty pageants. That said, evaluating prospective job applicants on the ratio “between the width of the nose and the length of the face” strikes me as more than a little creepy, if not totally, and completely socially backward (even if the job description implicitly requires the beautiful). As it happens, I had a long conversation with a good friend – a Chinese professional woman in her thirties – about this matter just last night, and her response was a chuckle. “You think Chinese women are the source of these ideas?” She asked me. [Addendum in response to an email] I have no idea how the International Olympic Committee feels about this, though by their recent standards and actions, it’s becoming increasingly clear that they don’t care about much more than efficient running of races. Still, there’s little doubt that beauty criteria such as those suggested by the Chinese would be totally illegal – as a matter of employment law – in the EU. Of course, these standards are being invented and applied by the Beijing committee, and thus they’re not subject to EU employment law. Fine and good. But can anyone imagine this sort of competition being staged for London 2012, much less the outrage that would erupt as a result? I guess it’s much too late to suggest that the IOC take an interest in good taste, much less the standards that it would expect of itself if the Olympics were held in Bern instead of Beijing. In an unusual confrontation for state media, the Xinmin Evening News yesterday published what it claimed was a fax from a local government body outlining other requirements, which formed the basis of a story last week. They included a standard that the distance from the forehead to the base of the nose, from base to tip of the nose and from tip of the nose to the chin should be equal. There was speculation that these standards were for internal use and never meant to be announced publicly. “Officials at an official news conference who don’t speak the truth have had great impact on the reputation of the media and the government’s credibility,” the newspaper said in an accompanying editorial. Officials could not be reached for comment yesterday and Monday’s news conference was closed to overseas media. This entry was posted in Olympics by Adam. Bookmark the permalink. Get a friend to translate this into Chinese and send it into a weekly news-magazine. It’d make a fine editorial. Gah. I guess when you have so many disposable people you can have such precise and stupid requirements. Two years ago I interviewed an official at the China Women’s Federation. She informed that such requirements based on age, height, weight, appearance, and in most cases gender are strictly illegal. But: no one cares, or enforces. The government is the biggest violator of its own laws, and the rest of the business world follows suit. they have no idea what “plump” means! The authorities are denying the story, so either the Xinmin Evening News was misinformed or the organizers have realized this might be embarrassing. Thanks for the kind words, Micah. I’ve been thinking about writing on this topic – in some form – for a while. So I might just take your advice on that. Lisa – As usual, great insight. There’s a great story in there. Cat – Thanks for that link. Interesting. For the moment, at least, the Xinhua story is still up. The funny thing is, even if it’s NOT true, the fact that Xinhua ran such a positive, approving story on the standards makes my point, partly, at least. Cearly, somebody at Xinhua thought the standards were a fine idea. Do you have any sense of how often – if ever – Xinhua/China Daily – pulls down a story like this if it turns out to be embarassing/false? You’ve definitely got a story here, Adam, and it’s got a lot better today. Yesterday’s denial by an official at a Putuo District press conference referred to the story as an “internet rumor” and claimed that the only physical requirements were the height restriction and that applicants “quite a good appearance” – plus the age limit. Other than that, all the requirements were to do with personality, education and an ability to speak English. Today, the Xinmin Evening News has hit back hard, with almost the whole of page 2 dedicated to rebutting the officials’ clumsy denial. Among other things, it says the editors couldn’t believe these standards could possibly be true and only published the report when they had confirmed this information really did come from an official source. Also on that page is the fax they received from the sports department to prove that they didn’t just make this up. The paper also says it got a strong readers’ response approving of its editorial. Looks like the officials could do with some advice from Imagethief. I messed up the html again. Here’s the link to the rebuttal (pdf) – hope I got it right this time. Cat – thank you VERY much. What nonsense. At London 2012 we should do the same. I don’t want to see ugly women hostesses handing out the medals to dignitaries. We want to see the best looking ones. EU law can take a running jump!